Lancashire CCC have announced the overseas signing of Australian international Joe Burns. The opening batsman will be available for 10 matches of Lancashire’s Specsavers County Championship Division Two campaign. Burns has played 14 Tests for Australia since making his debut against India in 2014, scoring three centuries with a batting average of 36.76. The 29-year-old also has a strong First Class record where he has amassed 6,685 runs in 101 games at an average of 40.51, with 38 half-centuries and 15 centuries. Burns plays his Sheffield Shield cricket for Queensland and has scored 380 runs at an average of 47.50 so far this season. Lancashire’s director of cricket, Paul Allott, said: “We’re thrilled to sign Joe as our overseas player for the majority of next year’s County Championship. “He strengthens our batting line-up and brings a wealth of experience into the side. “He will set a fantastic example to some of our younger batsmen in the way he approaches the game, both on and off the field. “He’s an incredibly ambitious individual, and having spoken to him, I know he shares the same aspirations that Lancashire Cricket have for the upcoming year. “We’ve heard only good things about his personality and character and I know he will have a very positive impact on our side. 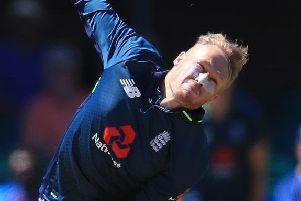 “With the IPL and ICC Cricket World Cup next year, it is not easy to find quality players who are available for the majority of the season, so we’re delighted to have signed Joe. Burns has previously played County Championship cricket in England with both Leicestershire, in 2013, and most recently with Middlesex in 2015. He added: “Lancashire is a huge county with a fine history in the game and I am extremely excited to have the opportunity to play for the Red Rose next year. “It will be a huge honour to play at a world class stadium like Emirates Old Trafford and I am very much looking forward to joining up with the squad.